Ever notice how the majority of command-line applications require about a dozen commands for a single logical operation? This tool aims to fix that! 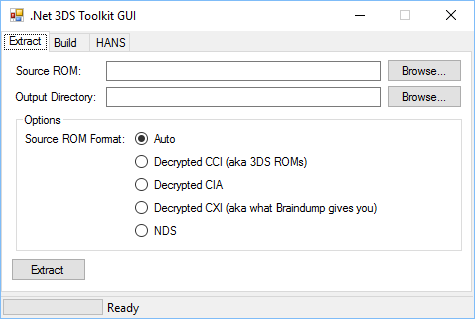 Not only is there an easy-to-use GUI, ROMs can be extracted and repacked with a single console command per operation. Free space on the system drive. Cleanup happens as soon as possible, but especially for larger ROMs, you may need several GB free. Copy private header to 0-key encrypted CCI files as they are built. Until this is done, any *.3dz files created are invalid until a private header is added. @Asia81 for HackingToolkit3DS, which provided the usage for 3dstool.